Raumfahrt+Astronomie-Blog von CENAP - Blog: Astronomie - ‘Oumuamua “Sped Up” in the Inner Solar System. This Might Be Why. 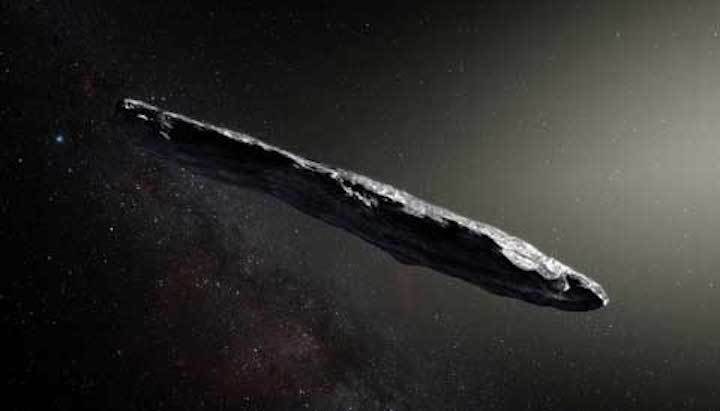 Artist's concept of interstellar asteroid 1I/2017 U1 ('Oumuamua) as it passed through the solar system after its discovery in October 2017. The aspect ratio of up to 10:1 is unlike that of any object seen in our own solar system. The brief interstellar visitor ‘Oumuamua left many mysteries in the wake of its zippy flight through the solar system. The changes in its brightness imply it was a cigar-shaped, tumbling body, but we never saw it close enough to know its true contours. We don’t know exactly what it was made of. We don’t know where it came from, although we suspect it was kicked out of another star system by a giant planet. One of the strangest enigmas, however, is that ‘Oumuamua appeared to hit the gas on its way out of the inner solar system. The body went a tiny bit faster than it should have if the only effect on its motion was the Sun’s gravity dragging on it. The best guess by Marco Micheli (ESA’s SSA-NEO Coordination Centre and INAF Astronomical Observatory of Rome), Karen Meech (Institute for Astronomy, University of Hawai‘i), and their colleagues when they discovered the anomaly was that ices vaporized from ‘Oumuamua’s surface by the Sun’s stark glare had given the body an extra kick. However, no observations had detected such outgassing. Reporting in an upcoming Astrophysical Journal Letters, graduate student Darryl Seligman (Yale), along with his advisor Greg Laughlin (also Yale) and Konstantin Batygin (Caltech), think they’ve found a solution — and, no, it’s not an alien spacecraft. The team revisited all the observations made during ‘Oumuamua’s whiplash visit and have concluded that outgassing could indeed be to blame. The tiny thrust from this migrating jet would cause the body to rock back and forth like a pendulum. This rocking would explain both the acceleration and the periodic pattern in ‘Oumuamua’s brightness, the researchers say. It also predicts a size for the body’s longest dimension — about 260 meters (850 ft) — that’s in keeping with estimates based on how bright the object was, assuming it was covered in ices long exposed to interstellar conditions. But Roman Rafikov (University of Cambridge, UK) is more skeptical. None of the authors’ plots of the object’s changes in brightness reproduce the real light curve, particularly the pointy minima naturally created by a spinning elongated object. “Just try spinning a cigar along its short axis, and you’ll see that the periods when you see it exposing [the] small cross-section pass quickly,” he explains. Furthermore, the outgassing should have changed ‘Oumuamua’s spin. Astronomers saw the body’s acceleration drop by a factor of four from late October to late November 2017 as the object raced away from the Sun. If this change happened because less sunlight was reaching the object and, thus, sublimating less ice, then the period of ‘Oumuamua’s pendulum-like tumbling should have doubled, which wasn’t observed. Laughlin agrees that the period should have doubled as the sunlight and outgassing dropped. “The accurate period information, however, is really just from the four nights October 24-25 to 27-28,” he points out. Observations from a month later do show that the period had changed, but it’s unclear how much. The team didn’t try to precisely fit their model to the real light curve, he adds, because they simplified the shape to that of a weaver’s shuttle and then varied the proportions. ‘Oumuamua’s body was probably more irregular. We will never know for sure what happened: ‘Oumuamua is now beyond Saturn’s orbit, and it will not return. We can only prepare for the next interstellar visitor.